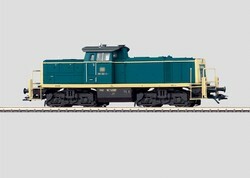 Prototype: German Federal Railroad (DB) class 290 heavy-duty switching locomotive. Former class V 90. Model: Comes with a digital decoder and controlled highefficiency C-sine propulsion. New maintenance-free high-performance compact engine, centrally installed with flywheel and 2 drive shafts. 4 powered axles. 4 traction tires. Lighting with maintenance-free LEDs. Headlights and marker lights, in conventional operation, can be digitally controlled. The acceleration and braking delay can be controlled digitally with the 6021 Control Unit. Outlined engineer's cab equipment. Separately applied metal grab irons. Enclosed additional steps. Length over buffers 16.4 cm / 6-15/32". Compact high-efficiency propulsion system C-sine motor. All driving axles are powered. The V 100 was too light for heavy switching work. This was why the German Federal Railway commissioned a new class from Maschinenbau Kiel (MaK). The V 90 - from 1968 on, designated class 290 - was supposed to be closely modeled on the successful V 100 general-purpose locomotive. This was not so much apparent from the outside; the V 90 was more angular than then V 100. However, inside, the German Federal Railway had proven components installed, such as the traction diesel that worked in the V 100/20 (212) and very similar cardan shaft transmission. On August 4th 1968 the German Federal Railroad accepted the V 90 001. 20 pre-series locomotives demonstrated the quality of the design in hard daily switching work. The series version had only slight design changes. By the 4th of September 1974 the German Federal Railroad had taken delivery of a total of 387 production machines from MaK, Deutz, and Henschel. Procurement ceased as a more powerful variant was ready, in the form of the 291. The 290 999 was a locomotive that the German Federal Railway leased from the military. It was purchased in 1990 and the German Federal Railway gave it the number 290 408. Today, the machines are working at all larger switching railway stations, and in addition are hauling transfers. However, they do not bear their original number. After installation of radio remote control the, DB gave them the designation 294.